Awesome Slide with a Twist! Description: Experience the thrill of riding the rapids down this wet mountain of fun. Riders shoot down individual sliding lanes where they encounter the thrill of a bump in the rapids before they scream around the curve and make a soft splash landing. 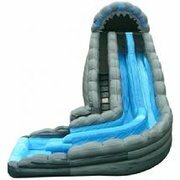 This beautiful Water Slide will blow your neighborns away!